There are certain spaces, primarily large-scale retail and leisure, where colour can play a more theatrical role. This is not architectural lighting in the strictest sense but using coloured lighting as art and attraction in its own right. Neverthess colour still has to be classy and controlled if it is not simply to be a brash beacon. As with the Urchin, it is often introduced as a measure to juje up an existing space. Located at the centre of a newly refurbished shopping complex, The Urchin bridges the junction between Town Square and the two primary malls in Brisbane, forming an events and meeting place. 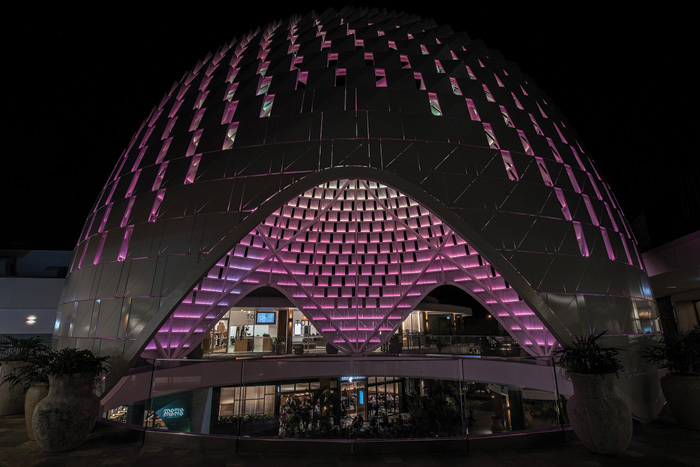 ‘Inspired by The Urchin’s organic form, the lighting design concept was to create a heart of the centre, encouraging guests to stop and immerse themselves in an interpretive and ethereal show of light, colour and movement,’ says Donn Salisbury of designer Electrolight. The vision was grand, the budget less so, which made it a challenging proposition. The design approach was ‘measured and succinct’, says Salisbury, using the panel geometry to magnify the lighting effect. The faceted panels are treated as digital pixels, crafting low-resolution abstract imagery and generating an expansive, illuminated 3D canvas. 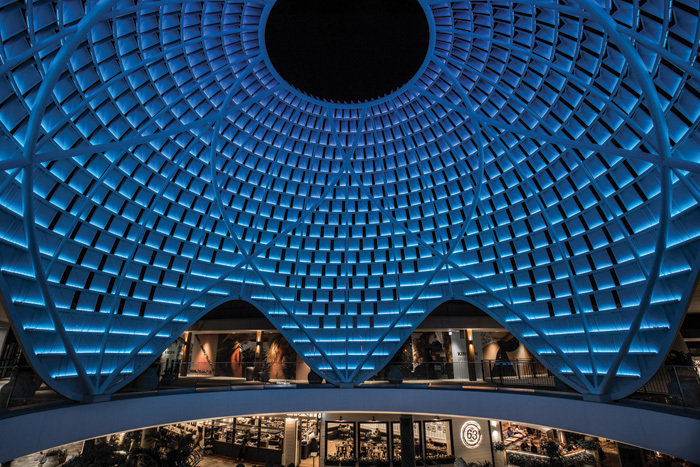 To achieve a seamless and integrated result, the Electrolight team worked closely with the engineers to conceal graphical node lighting within the structure using a custom channel system. More than 8,400 individually addressable RGBW nodes were used, spanning some 510 sq m and 1,450 panels. IALD judges, who gave the scheme an Award of Merit, commented on the ‘excellent integration of light sources into the sculptural canopy’. Electrolight also directed and coordinated the graphical content. It includes imagery based on themes inspired by nature, as well as time schedules and real-time web interfaces to the weather to trigger various scenes. ‘It was essential that the content appeared abstract so that the images are left to the interpretation of the viewer,’ says Salisbury. The lighting begins 15 minutes before dusk. When the sun disappears, a series of scenes are triggered with peaks of activity every 15 minutes, as well as a crescendo at the turn of each hour. Each day presents a slight variation in order, and real-time triggers ensure guests engage in a new experience every day.